Information Technology (IT) has become central to the way governments, businesses, social movements and even terrorist and criminal organizations pursue their increasingly globalized objectives. With the emergence of the Internet and new digital technologies, traditional boundaries are increasingly irrelevant, and traditional concepts—from privacy to surveillance, vulnerability, and above all, security—need to be reconsidered. In the post–9/11 era of “homeland security,” the relationship between IT and security has acquired a new and pressing relevance. 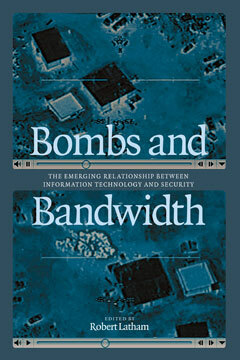 Bombs and Bandwidth, a project of the Social Science Research Council, assembles leading scholars in a range of disciplines to explore the new nature of IT-related threats, the new power structures emerging around IT, and the ethical and political implications arising from this complex and important field. Robert Latham is the author of The Liberal Moment and co-editor of Intervention and Transnationalism in Africa and Digital Formations. He lives in New York City.